Hello! Today I have my February Christmas Cards to show you. As most of you already know, I play the Splitcoaststampers Christmas Card Challenge where we make cards all year long so that were not stressed out during the busy holiday season. I make five cards a month so that I'll have about sixty cards at the end of the year. I try to keep layers to a minimum to make them easy and inexpensive to mail. I also do a 4 x 8 card so I can fit a letter and Christmas photo inside. I own a HUGE, retired Stampin Up! collection that I got years ago by stalking EBAY. However, I haven't been on EBAY since then, and I was surprised on a recent visit how few Stampin Up! products they had. They use to have thousands of stamps for sale, and the last time I checked I don't think they even had ten. I heard a lot of crafter's stopped selling on EBAY because they weren't making much of a profit anymore when the company raised their fees, perhaps that is why. Or maybe this is a fallout from the Stampin Up! decision a few years back not to allow any of their demonstrators to post links to other companies on their blogs. I don't know. In any case, there were not many Stampin Up! stamp sets on EBAY. I did however find this one, "City of David", and I was the only one who bid on it so I got it for the asking price of $14.95. Yeah! Lucky me! I've always loved this set. I'm not only constantly looking for religious Christmas images (they are quite rare), but also ones that are easy to create with. I loved the clean and simple design of the set, and the sentiments are so true! 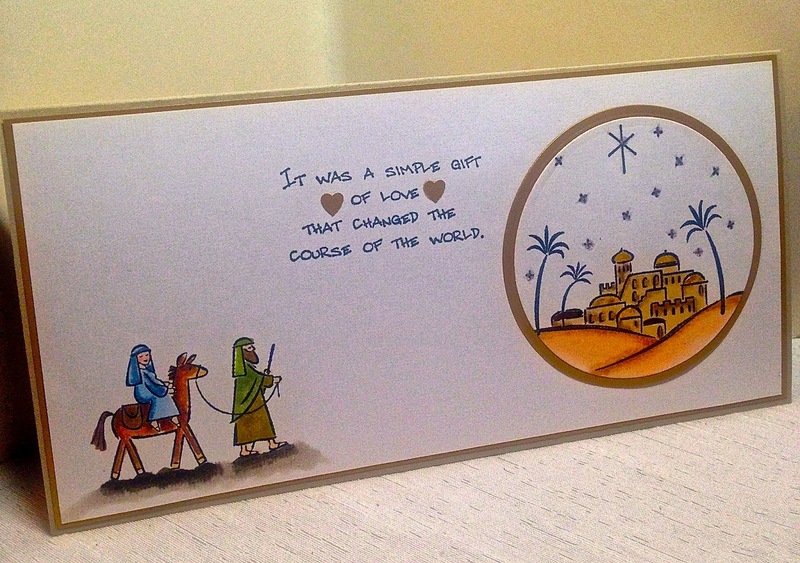 To make my card, I simply stamped Mary and Joseph in the left corner to make it look like they were going on a journey. I stamped the City of David on a separate piece of card stock, cut it out using a round Nestie, and then adhered it to a metallic gold card stock. The image is colored with Copic Markers. I used glitter pens on the domes, and then added some Stickles over the stars. I stamped my sentiment directly on the paper, and then punched some hearts out from leftover metallic gold paper to emphasize the word 'love' in the sentiment. I finished the card by adhering the main image panel to a metallic gold panel, and then attaching that to a Sahara Sand card base. A very clean and simple, yet, meaningful card. I love the way you designed this card. As I said before, I am really loving this card size too! The SCS buying and selling forum is also a good place to look for older sets, but I am sure you already know that. Me again, Amy. You got me curious and I went looking on ebay. There are now almost 50.000 stampin up items there again. I wonder if there was a glitch when you looked that one time. Unless you were looking for a specific set. Wow Ellie! Your right! I just checked myself. There must have been a glitch when I was there last. No wonder no one else bid on my item. That was highly unusual. I usually always get outbid on EBAY and have learned not to get my hopes up. LOVE the overall design of this CAS Christmas card! That metallic paper is so pretty! The sentiment is so true! Great job, Amy! I finally signed in to my google friend and follow your lovely blog. I hope you have a lovely day! I remember a few months back there was a huge glitch on ebay. My husband called me from work to check how his comic auctions were going and it kept telling me the user ID password etc. was not valid. I thought someone hacked our ebay. I even ended up cancelling bank cards, etc, it was a pain...might have been around the same time, because the auctions he had up where nowhere showing up on ebay. Anyway, I think when/if I ever am not on a DT anymore, I will start looking on ebay too, I used to love hunting for SU deals on ebay :-) so much fun!! Your probably right Ellie, because that would have been the time I bid on this set. But now that I know SU! is alive and well on Ebay, I might be bidding or selling myself. Oh this is so fabulous, love the bling you added to the stars and the fabulous sentiment.